My solo exhibit, Local impressions – plantlife, pigments and place, opens on February 26, 2019 in the Sarah B. Smith Gallery at McGuffey Art Center in Charlottesville, Virginia. The show celebrates our flora and landscape, using images, prints, and pigments derived from local plantmaterials. The exhibit runs from February 26 – March 31, 2019. The opening reception is Friday, March 1 from 5:30 - 7:30 pm. Teeny Tiny Trifecta kicks off Second Street Gallery's 45th Season and will consist of three works of art, by each of the 65 artists included in the show. A wide range of styles, techniques, and mediums will be represented, and all pieces measure 10 inches or smaller. Work from my Remains series (pictured above) will be included. Curated by SSG’s Executive Director and Chief Curator, Kristen Chiacchia, Teeny Tiny Trifecta is inspired by both Cabinets of Curiosities as well as the Paris Salons of the 19th Century, but with a modern twist. The exhibition aims to showcase the wide range of talented artists in Virginia and beyond, while providing an accessible introduction to contemporary art collecting. All work will be priced at $100, and will be available for sale starting at the opening on September 7, 2018. Once the exhibit is underway the works will also be available for purchase online. For more information visit the exhibit website. Noxious Nuances will be on display at Riverviews Artspace's Invitational Print Show in September/October. Riverviews Artspace in Lynchburg, VA, welcomes 22 printmaking artists to the Craddock-Terry Gallery this fall. This exhibit is a showcase of the diversity of the medium and the skill of the artists who practice printmaking in its many forms. I am honored to have my work included in this exhibition, which runs from September 7 to October 9, 2018. For more information visit the exhibit website. My artist books and other bound works will be on display at Gay Street Gallery this summer. My work will be showcased along with nature paintings by Freya Grand and scenes from Cape Cod painted by Kevin Adams. The exhibit will be up through August 27 and there is an artist reception on Saturday June 16, from 4 – 7 pm. 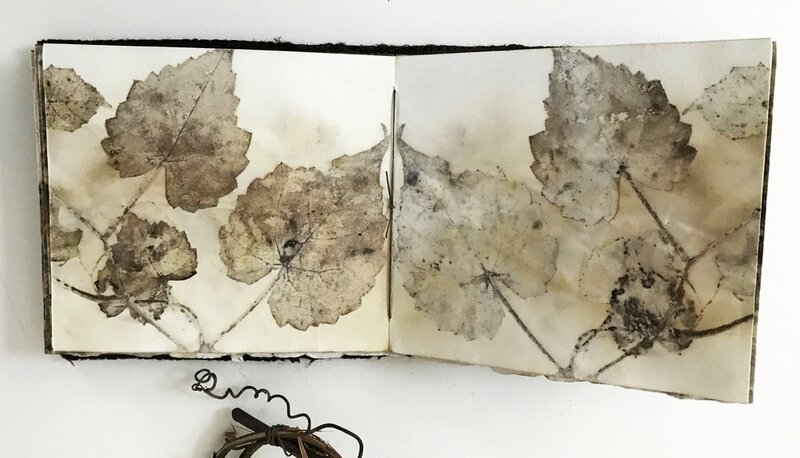 New work based on botanical contact prints, relief processes, and digital captures are presented in the exhibit Tracings from Nature at McGuffey Art Center from May 2 - 28, 2018. My work is displayed alongside nature drawings by Erica Lohan. Join us for the opening reception May 4, 5:30 - 7:30. High Country Herbarium: Preserving Plants and Plant Communities in the southern Appalachians opens on February 2, 2018 at the Turchin Center for the Visual Arts at Appalachian State University in Boone, NC . The exhibit juxtaposes contemporary art, music, and poetry, with the university’s vast collection of herbarium vouchers (pressed plant samples). The exhibit will be up until August 4, 2018. A couple of my pieces are featured, including interconnection, shown here along with one of the herbarium vouchers. There is a celebratory reception at the Turchin Center, on March 2 from 6 – 10 pm. Come visit us for the 23rd annual Artisans Studio Tour, on November 11 and 12, 2017. During the weekend forty-five artists in 24 studios in the Charlottesville area will display their work. Patrick Gibson will be showcasing his beautiful pottery again this year. I will introduce new art during the tour as well as journals, scarves, pillows, and sachets. Treats and refreshments from A Pimento Catering and Albemarle Baking Company will be offered. I hope you will join us! We will be open from 10 am – 5 pm each day. The address is inleaf studio, 721 park street, charlottesville, va 22902. For more information about the tour and its participants visit the website. Disintegration, by Lotta Helleberg, 2017, Japanese mulberry paper, Strathmore printing paper, indigo dye, and botanical contact prints, hand and machine stitching, 34" x 25"
I am excited to be part of this intriguing exhibit at LABspace—a gallery in Hillsdale, NY. Indigo: The Seventh Color is a group exhibition of works on indigo paper curated by Lorrie Fredette and Brece Honeycutt. It runsfrom October 14 – November 4, 2017. An opening reception will be held on Saturday, October 14 from 5:00-7:30 pm and thereafter the gallery will be open weekends 11 to 5 p.m. and by appointment. “The beauty of Indigo magnetically attracts the viewer. It's richness and depth is an intoxicating visual drink. Dots, dashes, cosmologies; burn marks, rusted tones, twisted strands; grids, stains, topographies; chronicle the works by Christine Aaron, Beth Dary, Grace DeGennaro, Lorrie Fredette, Valerie Hammond, Jeanne Heifetz, Lotta Helleberg, Brece Honeycutt, Patricia Miranda and Paula Overbay. This insightful and thought provoking exhibit includes work by over 20 renowned fiber artists from across the United States. I am honored to have my piece reverence / dogwood included. The show will be on display until December 3, 2017. For more information contact WMQFA. I am proud to have my work Emergence on display for this exhibit at Arrowmont School of Arts and Craft, alongside work by many of the talented and accomplished artist who will teach at the school this year. The show is open from May 13 – July 22, 2017. My workshop Botanical Bounty runs from October 1 - 7. There may be a few spots left and you can register via the class page or contact Arrowmont for more information, 865-436-5860. A handful of regional artists will display contemporary work in this exhibit that focuses on art quilts that incorporate photography and printmaking techniques. Three of my pieces are featured in the show, including entanglement (right). that opens on February 14, 2017 and runs through the end of May. For more information about the Virginia Quilt Museum and the exhibit, visit their website. My work is included in two exhibitions in Charlottesville during the month of January. Green Mind is a group exhibit at Chroma Projects Art Laboratory, that will feature several of my artist books. The show originated in Washinton DC, based on the botanically focused paintings of Sharon Fishel and Beverly Ryan. Chroma Projects is expanding the concept to include my work as well as drawings by Linda Wachmeister, sculptures by Sonja Weber Gilkey, and an installation by James Yates. Green Mind is on display January 6 - 28, at Chroma Projects new gallery space downtown Charlottesville. There is an opening reception Friday, January 6 from 5 -7. I am also part of the New Member's Show at McGuffey Art Center, along with 13 other artists who were juried in as new members in 2016. Several of my recent wall hangings will be on display. There is also a fantastic show in McGuffey's main gallery in January featuring work by Nini Baeckstrom, Carol Grant, and Scott Smith. Bot shows are up from January 4 - 29, 2017, and the opening reception is Friday January 6, 5:30 - 7:30. The exhibit highlights fine craft and includes work by fifteen Virginia artists. My quilt Scenes from a landscape is one of the pieces on display. The exhibit will be featured in the Exhibit Gallery on the second floor of the Wayne Theatre, from December 1, 2016 – February 26, 2017. Visit the Wayne Theatre website for hours and additional information. The opening reception is Thursday, December 8, 5 - 7 pm. My studio will be open for the 22nd annual Artisans Studio Tour, on November 12 and 13, 2016. During the weekend forty-two artists in 23 studios in the Charlottesville area will display their work. I am excited to host Patrick Gibson and his beautiful pottery again this year. I will introduce new art during the tour as well as artist books, journals, scarves, and sachets. Treats and refreshments from A Pimento Catering and Albemarle Baking Company will be offered. I hope you will join us! We will be open from 10 am – 5 pm each day. The address is inleaf studio, 721 park street, charlottesville, va 22902. For more information about the tour and its participants visit the website. I am honored to be part of the upcoming group exhibit Fiber transformed at McGuffey Art Center in Charlottesville, VA. Fiber Transformed is a regional group of textile artists that meet monthly for exchange of ideas and informal critiques. A selection of my work will be on display along with work by the five other members: Mary Beth Bellah, Jill Jensen, Jill Kerttula, Lorie McCown, and Wrenn Slocum. I am honored to be part of Arbor Week, at Wave Hill Garden in the Bronx, NY, later this month. I will be a guest artist in the garden shop on Saturday, April 30 and Sunday, May 1, 2016, from 10 am - 4 pm each day. I invite all to come by to experience this wonderful place, and would love to have a chance to meet and share my work. I will bring along small artworks, notebooks, sachets, and scarves among other things. Visit the Wave Hill website for more information about the event and the beautiful garden. I am honored to announce my solo exhibit "second nature" at Art on Ivy, Virginia Arts of the Book Center (VABC), in December. The show will feature current work, documenting plants and colors from our local surroundings. Opening reception, Friday December 4, 5 - 6:30. The weekend of November 7 and 8, thirty-five artists in 17 studios in the Charlottesville area will display their work. My Charlottesville studio will be open and this year I am hosting Patrick Gibson and his beautiful pottery during the tour. I will have new wall art on display, as well as artist books, journals, scarves, pillows, and more. Treats and refreshments from A Pimento Catering and Albemarle Baking Company will be offered. I hope you will join us! We will be open from 10 am – 5 pm each day. The address is inleaf studio, 721 park street, charlottesville, va 22902. For more information about the tour and its participants visit the website. My quilt Reverence / Dogwood is included in the exhibit Quilts=Art=Quilts at Schweinfurth Art Center in Auburn, New York. This international group show was juried by Mary Anne Jordan, Linda Colsh, and Cynthia Corbin, and includes 68 artists from across the US, in addition to Australia, Canada, Netherlands and Taiwan. The exhibit is open from October 31, 2015 to January 3, 2016. Reverence /dogwood has been accepted for Sacred Threads, a biennal art quilt exhibit in Herndon, Virginia. The show includes work that explore themes of spirituality, joy, inspiration, peace, grief, and healing. The exhibit runs from July 10 - 26, 2015, with an artist reception on July 11, from 2 - 4 pm. My book Quercus Alba will be part of the upcoming exhibit Hello Hedi at 23 Sandy Gallery, in Portland, Oregon, this summer. All work on display will be inspired and influenced by the renowned book artist Hedi Kyle. The show runs from June 5 to July 25, 2015, with an artist reception on June 26. Pulp, an exhibit all about paper, is on display during the month of February at LibertyTown Arts Workshop, in Fredericksburg, Virginia. My book What Lies Beyond, will be included along with works by artist from all over the world. The show runs from February 6 to March 1, 2015. There is an opening reception on Friday, February 6, from 5 - 9 pm. My still life / pecan and still life / false indigo, will be on display along with over 100 other small works by local and regional artists at the Warm Springs Gallery in Charlottesville in December. This invitational exhibit will be up throughout the month of January and there is an opening reception on Friday, December 5, from 6 - 8 pm. The weekend of November 8 and 9, forty artists in 22 studios the Charlottesville area will display their work and greet visitors. I will be one of them. For the first time I will open my own studio doors during this prestigious event. I will hang new wall art and display artist books, journals and home goods. Treats and refreshments from A Pimento Catering and Albemarle Baking Company will be offered. I hope you will join me! We will be open from 10 am – 5 pm each day. The address is inleaf studio, 800 east jefferson street, charlottesville, va 22902. For more information about the tour and its participants visit the website. Guest artist in the garden shop.